We have been upgrading and modernizing the interior and the textiles each year since 2011. 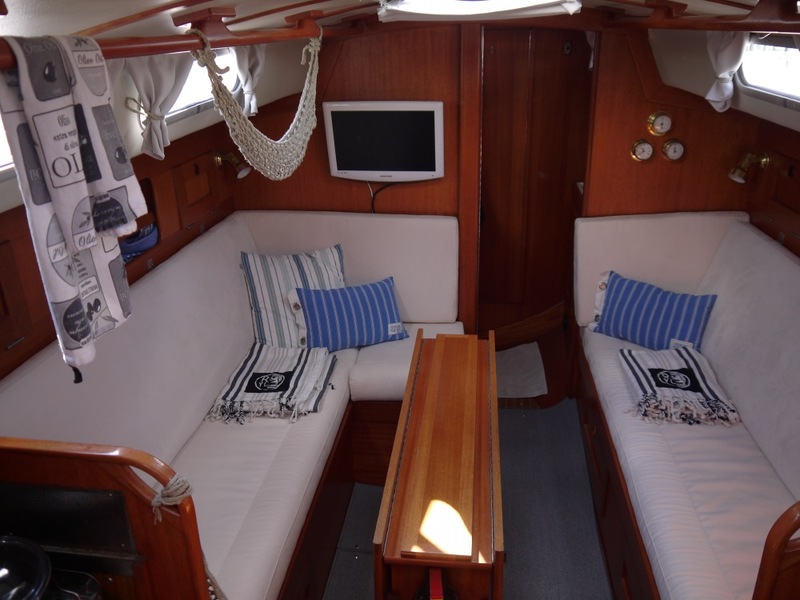 Summer 2011 was also Minna's first sailing season, and her first idea was to bring some colour onboard with turquoise pillows and blankets. Minna also crocheted a net for the fruits, which was very handy. 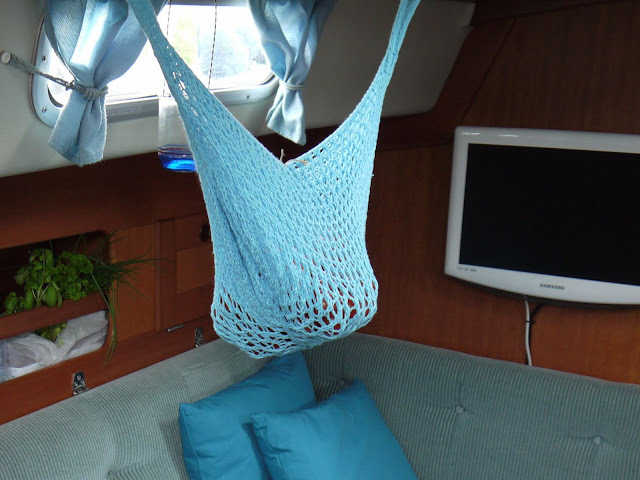 However, the net, hanging in the cabin, was a bit too long so there was a risk of getting hit by a tomato when visiting the toilet while sailing. Thus, the design was improved for the next year. 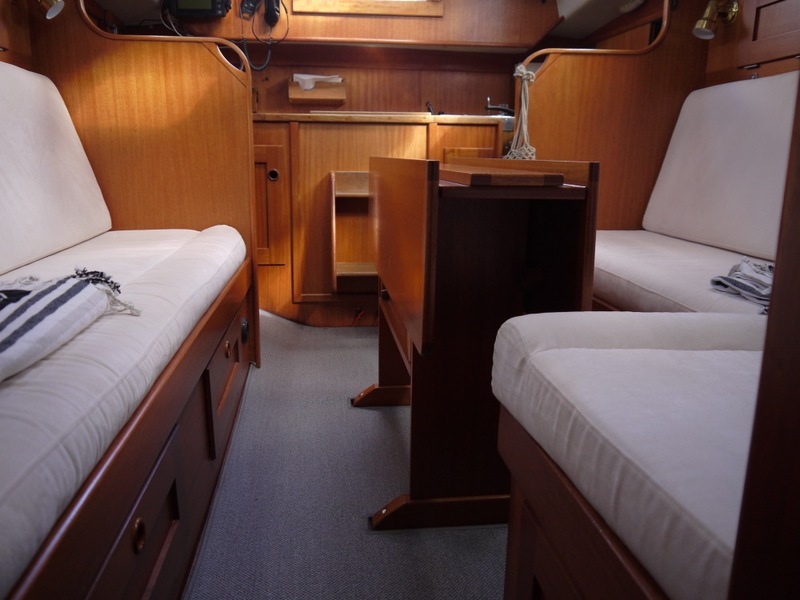 During the following winter, Minna sewed Dolphin Dance's new light coloured curtains and we bought a V-shaped pillow-top mattress for the fore peak. We also improved the organization on board with various storage boxes. The mattresses were renewed during the winter 2012/13, as especially the saloon settees started to be rather worn out. Many of the buttons were missing, the torn fabric was repaired multiple times and the colour was partly washed out. Furthermore, there were some mold spots on the underside of the mattresses as we probably had not paid enough attention to lifting the mattresses up each morning. For the season 2014, we replaced the original, already worn out blue carpet with a grey one. This new carpet fits better in the light colour of the mattresses. 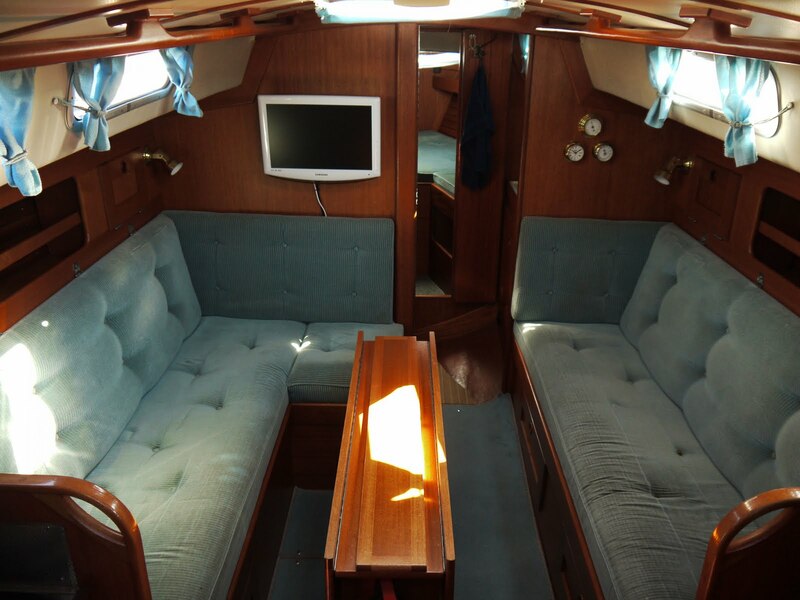 For the coming season, we do not have any major plans in mind regarding the interior. The biggest project is probably going to be replacing the sink and the tap in the heads. Upean muodonmuutoksen olette toteuttaneet DD:lla! Tämä uusittu salonki on todella raikkaan, valoisan ja viihtyisän näköinen. Onko noita puuosia pitänyt myös huoltaa, vai ovatko tosiaan säilyneet noin hyvinä? Kiitos, kaikki puuosat sisällä ovat alkuperäisessä kunnossa ja lakkauksessa. Patjojen uusimiseen painavin syy oli allergia, mutta samalla on mukava uudistaa veneen koko ilmettä. 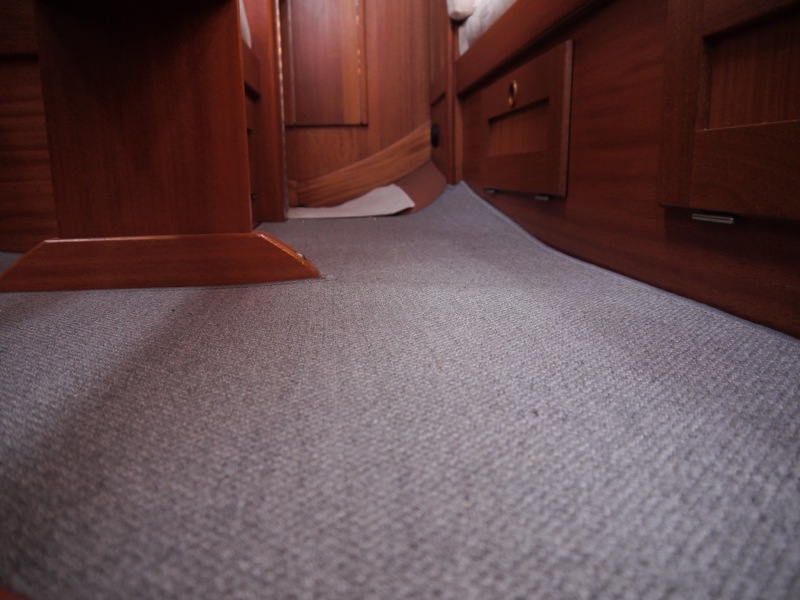 The interior of the above yacht is just amazing,the best ever seen and well managed.The new carpet will add the charm to the beauty of carpet.The yacht should have better textured hotel carpet or casino carpet. The modern time hotel carpet suppliers make such textures that will this type of stylish interior.Happy with the reviews of people. One of the most premium things I have ever seen, it definitely will be an interesting experience.